Habit: Perennial herb, rhizomes extensive, scales brown. Stem: 0. Leaf: basal, long-petioled, 2--3-ternate; leaflet blades ovate to +- cordate, lobes 3, shallow, teeth 0 or shallow. Inflorescence: raceme or panicle, +- scapose, open, long-peduncled; flowers spreading to pendent. Flower: sepals generally 12--15, 8--9 mm, outer 6--9 << inner 6, bract-like, deciduous, inner petal-like, persistent, in age reflexed; petals 6, < inner sepals, reflexed from base, distally glandular; stamens generally 6, held against ovary, style, anther valves flap-like, pointed tipward; ovules 2--10, style 1, < ovary, persistent, beak-like in fruit, stigma cup-like. Fruit: capsule, 2-valved, generally elliptic. Seed: with oily body for ant dispersal. Species In Genus: 3 species: temperate western North America. Etymology: (Captain George Vancouver, British explorer, 1757--1798) Note: Pedicel appears to arise from inside flower, from tip instead of base, yielding an upside-down or "inside-out" flower. Leaf: persistent in fruit, 10--30 cm, adaxially glabrous, abaxially glabrous to sparse-hairy; petiole sparse-hairy, in age glabrous, red-brown. Inflorescence: panicle; upper axis short-glandular-hairy: pedicel short-glandular-hairy in lower 1/3. Flower: outer sepals 2--4 mm, inner 4--5 mm; petals 3--4 mm, white or tinged lavender, tip flat, notched; filaments glabrous. Fruit: body 5--7 mm, glabrous. Chromosomes: 2n=24. 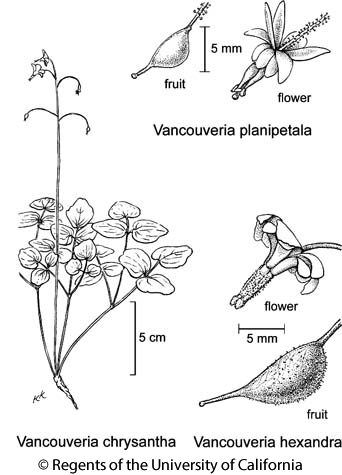 Citation for this treatment: Michael P. Williams 2012, Vancouveria planipetala, in Jepson Flora Project (eds.) Jepson eFlora, http://ucjeps.berkeley.edu/eflora/eflora_display.php?tid=47786, accessed on April 25, 2019. NW (exc NCoRI), SnFrB, SCoRO (Santa Lucia Range); Markers link to CCH specimen records. Yellow markers indicate records that may provide evidence for eFlora range revision or may have georeferencing or identification issues. Purple markers indicate specimens collected from a garden, greenhouse, or other non-wild location.